Introduce storage and warmth into your entertainment space with this rustic-inspired fireplace console. The console features two doors with one shelf behind each, as well as two open shelves and a soundbar area. An electric fireplace is the true highlight of the piece, radiating warmth for a cozy and welcoming environment. 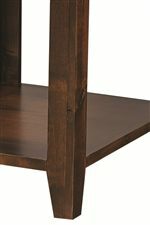 A natural finish completes the look for rustic style with amazing function. 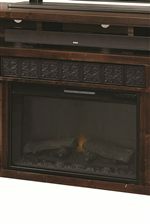 The Alder Grove 84" Fireplace Console with Soundbar Area by Aspenhome at Walker's Furniture in the Spokane, Kennewick, Tri-Cities, Wenatchee, Coeur D’Alene, Yakima, Walla Walla, Umatilla, Moses Lake area. Product availability may vary. Contact us for the most current availability on this product.